I love the idea of using a custom error page to communicate the gospel — I wish I were that creative! Above is the 404 page that you used to get from Mars Hill Church. Think about ways that you can use your 404 page to educate, encourage, or entertain. Hopefully your site is organized well enough that people won’t see the page often, but they will eventually — it might as well be a positive experience! Depending on how you’re hosting your web site, there are different ways to customize your error pages. 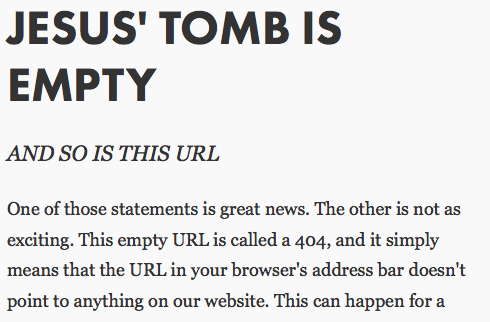 If you’re using WordPress, your theme might have a custom 404 page template as described here. If you’ve coded your site manually, your web host might have a control panel to edit error pages, or you can point to custom error pages via your .htaccess file. The web host 1and1 shows how to use the .htaccess file here. This entry was posted in linux, tips&tricks, webdev on December 28, 2012 by karl.kranich.